As an alternative for manipulating colors, your Canon Rebel T3 or T3i enables you to tweak white balancing in a way that shifts all colors toward a particular part of the color spectrum. The result is similar to applying a traditional color filter to your lens. Set the Mode dial to P, Tv, Av, M, or A-DEP exposure mode. You can take advantage of White Balance Correction only in these modes. Display Shooting Menu 2 and highlight WB Shift/Bkt. The first two numbers next to the option name indicate the current amount of fine-tuning, or shift, and the second value represents the amount of white balance bracketing enabled. The screen contains a grid that’s oriented around two main color pairs: green and magenta (represented by the G and M labels) and blue and amber (represented by B and A). The little white square indicates the amount of white balance shift. When the square is dead center in the grid no shift is applied. Use the cross keys to move the shift indicator marker in the direction of the shift you want to achieve. As you do, the Shift area of the display tells the amount of color bias you’ve selected. If you’re familiar with traditional lens filters, you may know that the density of a filter, which determines the degree of color correction it provides, is measured in mireds (pronounced “my-reds”). 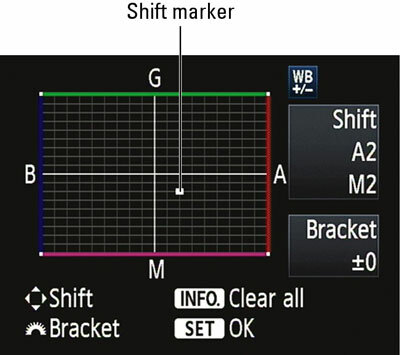 The white balance grid is designed around this system: Moving the marker one level is the equivalent of adding a filter with a density of 5 mireds. Press Set to apply the change and return to the menu. After you apply White Balance Correction, a +/- sign appears next to the White Balance symbol in the Shooting Settings display. It’s your reminder that White Balance Shift is being applied. The same symbol appears in the viewfinder, right next to the ISO value. Your adjustment remains in force for all advanced exposure modes until you change it. And the correction is applied no matter which White Balance setting you choose. Check the monitor or viewfinder before your next shoot; otherwise, you may forget to adjust the white balance for the current light. To cancel White Balance Correction, repeat the steps, set the marker back to the center of the grid, and then press Set. Use the cross keys to move the marker back to the center of the grid. Be sure that both values in the Shift area of the display are set to 0. As an alternative, you can press the Info button after you get to the grid display. After you press Info, be sure to press Set to lock in your decision. Many film photography enthusiasts place colored filters on their lenses to either warm or cool their images. Portrait photographers, for example, often add a warming filter to give skin tones a healthy, golden glow. You can mimic the effects of these filters by simply fine-tuning your camera’s White Balance settings as just described. Experiment with shifting the white balance a tad toward amber and magenta for a warming effect or toward blue and green for a cooling effect.